Congratulations Nel! Email me with your contact details and I will put the book in the post to you this week. If you didn't win this time check Nel's blog in the next couple of weeks as she'll be passing the book on to another reader soon. Now, I don't know how it was in your neck of the woods this weekend but it was bitterly cold in these parts. And I'm not sure why I'm talking like this...evidently frigid temperatures make me talk like the Clampetts. Frigid temperatures also make me want to pull out my cookbooks and try some new recipes. Okay, so I like cookbooks...love to buy them and love to read them but I'm not always good about remembering to actually cook from them. Like the rest of America I received a copy of The Pioneer Woman Cooks this Christmas. I've made several recipes via her website but on Saturday night I actually used the cookbook. I made her recipe for linguine with clam sauce and it was delicious. My husband loved it too but he struggled to understand the 'pioneer' part. She says this is one recipe that is maybe not as 'cowboy friendly' as some of her others but it is really tasty and also quick and easy...if you have her book give this recipe a try. In a soup pot over medium-low heat, melt butter. Add shallots and onion and saute, stirring until translucent, about 4 minutes. Add wine, stir well, and bring to a boil. Reduce heat to medium-low and simmer until wine is reduced by half, about 10 minutes. Add parsnips, chicken stock, vinegar, salt and pepper and bring to a boil. Reduce heat and simmer gently, uncovered, until parsnips are completely tender, about 45 minutes. Remove pan from heat and use immersion blender to puree the soup (or cool slightly and carefully puree in batches in food processor or standing blender). Transfer puree to saucepan and whisk in the half and half. Warm over low heat until steaming. I served this with The Barefoot Contessa's Jalapeno Cheddar Cornbread which is fab-u-lous. Seriously fabulous. I highly recommend...this cornbread recipe makes a large pan so I froze the leftovers. Enjoy! Oh Joyce, freezing, ice-cold wintry weather definitely puts me in the mood for cooking. I think you did a great job with your recipe explaining, photo taking, cooking extravaganza. I like the Barefoot Contessa and the Pioneer Woman both. I'd love to try both of these recipes. I recently found a recipe for "Cheddar Chowder" from another blogger that I will give props to after I make it and then post about it. IN the first place, I'm impressed with your cookbook collection. In the second place, it was cold here in Florida, too, but not like your neck of the woods. (Clampette-speak). In the third place, who wouldn't like vegetables if you put maple syrup on them?!?!? Oh, wow! That looks fantastic. Could you wait 4 days for me to get there and help you eat the leftovers???? Looks yummy, Joyce. I'm sure our temperatures are not a frigid here as they are in your neck of the woods (good Southern expression), but it's been plenty cold, and we've eaten lots of soup lately. A couple of weeks ago, I tried a recipe for turnip green soup. Good, but I would use less salt if I make it again. I don't know that I've ever eaten parsnips. They were definitely not something my mother ever cooked, but then she never cooked brussels sprouts either. Love parsnips- love cornbread - Yep, pretty much love food in any shape and form. Well Thank you! I will email you my info. 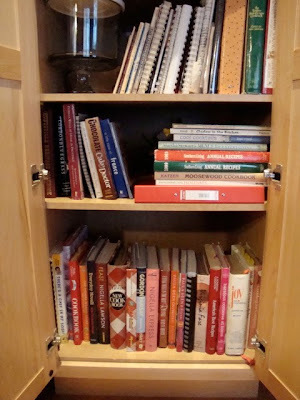 I also enjoy cookbooks even though I have more recipes than I'll ever try in a lifetime. Still, it's a relatively cheap form of therapy. Hope you don't mind. I added a link to your blog on arise 2 write. That soup sounds delicious! I have never fixed parsnips, but I'm like you, I love all vegetables, so I'm sure I would like it. I want to try that cornbread too. I'm going to have to get an immersion blender. So many cooking shows I have watched recently have used them. If it snowed all the time where I live, I would weigh a ton, because I love to cook too, when I am snowed in. It wouldn't do for me to live in Alaska. Love & blessings from NC! It's been so cold here too and as you've read I was in for 4 days and have cooked up a storm.